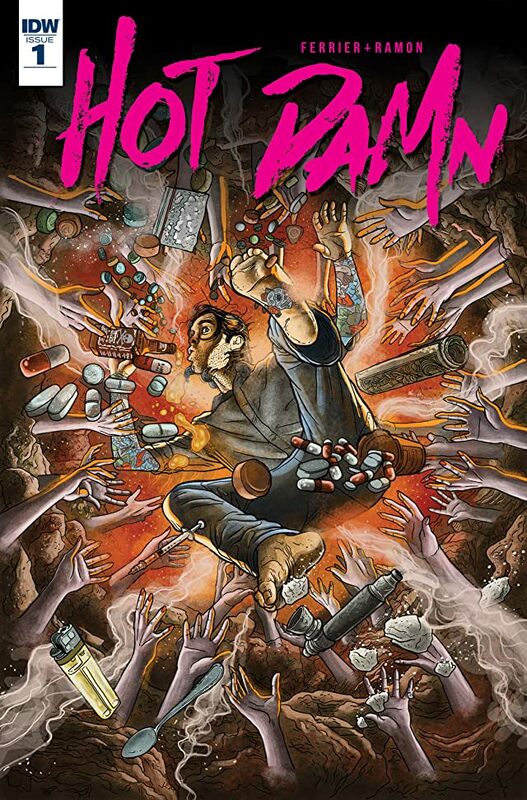 I can’t say the cover of Hot Damn #1 tells you EVERYTHING about the comic, but it sure as s–t tells you a lot. Heroin, alcohol, cocaine, pills, and some very lascivious looking female hands reaching out for our protagonist. Really though, the only thing our lead character Teddy has ever been a “pro” at is being a junkie, and now hes doing his time in Hell (which looks a lot like a post-apocalyptic Cleveland, or, you know, just regular Cleveland). One of my favorite things about the book is Teddy’s group therapy counselor, Abaddon. Yes, THAT Abaddon. The biblical-described angel known for being the “king of an army of locusts”. Here though, he’s better defined as a goat-head cool-bro who’s more a “babysitter of druggie, scumbag f–ks” than a king of locusts. I just love his demeanor. He’s like the perfect satire of a therapist who just wants his patients to think he’s cool, and so he dresses super business casual and says stuff like, “Wicked sesh today everyone”. (He could also have passed for literally every youth pastor.) Normally I loath the living hell out of people who un-ironically shorten words that have no f–king business being shortened (example: “cas” = casual, “sitch” = situation, “dur” = “I’m a moron who can’t speak or type a couple extra syllables.” LOL! JK! YOLO! ), but since Abaddon is essentially a parody, and this gave me the perfect opportunity to publicly belittle that type of people, I approve it. 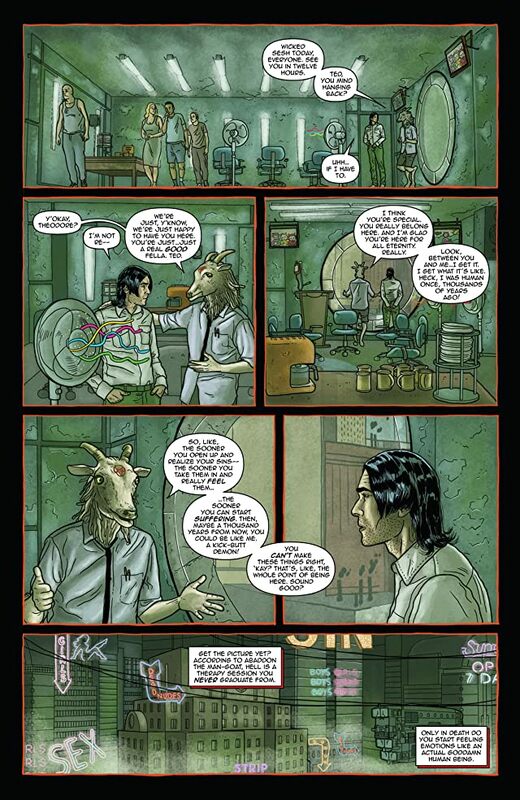 Not to harp on the Abaddon character, like I…uh… already did a bunch, but I especially love how perfectly “creepy goat” he is. Ramon doesn’t miss one little nuance of how unnerving goats can be with those dead eyes and blank stares. Like that goat from The Witch, Black Phillip. I like to imagine that when BP isn’t tormenting pilgrims on Earth, he’s down there leading self-help camping trips to the Lake of Fire. Oh, and Ramon also does smack. *Editor’s note: No he doesn’t! *Writer’s note: YES HE DOES! 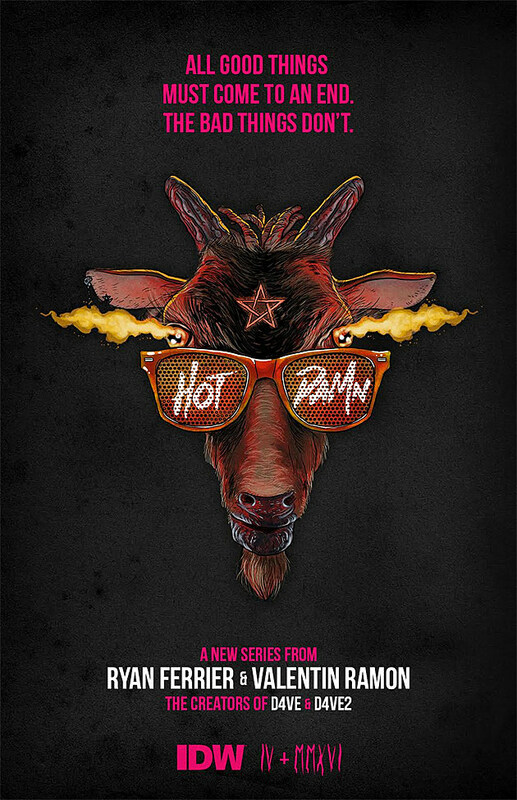 Ok, so should YOU read Hot Damn? Well, are you easily offended by things like excessive substance abuse, foul language, and camel buttholes? If you answered “no, and I actually wrote my college thesis paper on every one of those things”, then you should read Hot Damn. If you answered “Yes, I’m a Quaker.”, well then, you should still read Hot Damn. I mean, who knows, maybe this’ll be the thing to push you over the edge and go all Michael Douglas from Falling Down. That’d be hilarious! *Editor’s note: While a phenomenal acting performance from Mr. Douglas, 4LN does not share the views of this writer, and does not condone the humor in homicide. *Writer’s note: This is why your wife left you. I had too many songs I wanted to listen to while I read this book, so I’m suggesting all of them. A “Hot Damn Playlist”, if you will. Enjoy! Every Time I Die’s “Ebolarama”, from the album Hot Damn!